Postage cost depends on what country you live in and what type of products/quantity of products you order. Postage starts from £2.50 in the UK. The best way for you to find this out is to add your desired product(s) to your cart and proceed to checkout, the postage will then be calculated for you. Why is the amount I've been charged different to what the price was in the cart? This is due to our currency, our site is priced in GBP by default. We have a converter at the top of our website so you can view our prices in your local currency. Your order total will also be converted to your currency by PayPal before you submit your order. We aim to dispatch your order within 5 business days however times may be longer during busy periods. You will receive a second email when your order has been shipped. All International parcels are sent via Standard Mail so there is no tracking number available (unless you have added Tracked postage to your order). Please do not progress your order with us until after this time period. These are guidelines and if there are unexpected delays in customs, it can take longer. If you added International Tracked postage to your order you will receive an email with a tracking number. We cannot guarantee that all orders can be changed or cancelled as they may have already been processed, however we try our best to amend or cancel orders upon request. Can I return or exchange my item(s)? You must contact us within 7 days of receiving your order and a return or exchange must be agreed prior to sending your item(s) back. Check our terms and conditions page for further details. I've just placed an order and forgot to use a discount code/just found a discount code, can I still use it? Unfortunately all discount codes must be used at the time of the order being placed as we cannot add this on to the order. Do you do sponsorships/can I be a promoter/model for you? We are currently not looking for sponsors, promoters or models to work with. Due to the high volume of emails we receive daily on this subject, we are unable to reply to everyone individually. Yes we do, Please contact us via the link at the bottom of the page. 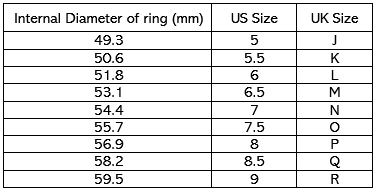 If you are not sure of your ring size then please follow our below instructions. Use a piece of string or thin piece of paper, wrap it around your finger and make a pen mark where both ends meet. Then just measure this with a ruler and find your closest match in the table below.